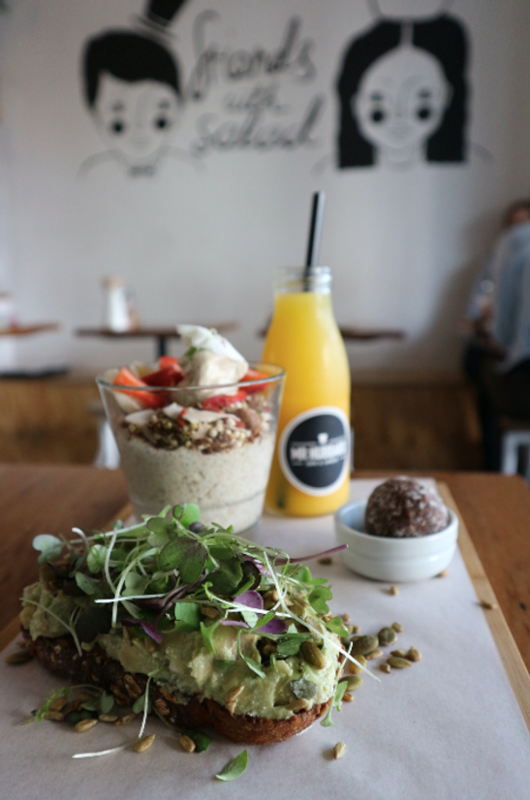 If there’s one café that exemplifies Melbourne’s obsession with clean eating, organic produce and brunch, it’s Mr Hubbard. The menu is loaded with ingredients like quinoa, kale, feta and fresh fruit, composed into dishes that are classic brunch style but unique in their own Hubbard way. The café, though not overly large, is airy and light with a display window showcasing a variety of super-food salads and ready-made meals. There’s no doubt this café sees as many takeaway customers as they do in-house diners. With a diverse menu packed with meals that you can guarantee are nutritious and healthy, we narrowed it down to the Breakfast Board and Poke Bowl. Colourful, vibrant and photogenic, these dishes not only tasted delicious, they looked stunning and proved that we certainly eat with our eyes. The smashed avo has a healthy dose of fresh herbs and feta and isn’t over-smashed so you get some hearty chunks in the mix. There’s a lovely tang of lemon juice and the texture is lush and creamy; an outstanding smash. It’s also piled quite high on the toast and I don’t think anyone’s ever complained about too much avocado. A hybrid between chia pudding and overnight oats, the cold Coconut Quinoa Porridge is creamy with a delicate coconut flavour. The sweetness comes more so from the fresh banana and strawberry garnish. As someone who normally enjoys porridge hot, this cold version provided a refreshing balance to the avo smash. The presentation is stunning and the edible flowers are a beautiful finishing touch. The third element on the Board is a superfood protein ball. The flavour of the day today was peppermint with cacao. The chocolate and mint blend is well balanced and the texture is perfectly chewy and crumbly. Pro tip: save the protein ball until the end of the meal and it becomes sort of like an after-dinner mint. The perfect note to end on. The poke bowl was a rainbow explosion of colour, so beautiful that it felt a shame to dig in and destroy the arrangement. The salmon was soft, very clearly fresh and the wasabi mayo had enough kick to bring the dish even further to life. The quinoa and brown rice mix was well cooked, soft and fluffy. This bowl was delicious enough that we didn’t let a single grain of rice go to waste. Above the food, the staff at Mr Hubbard ought to receive congratulations for their hospitality. The venue wasn’t particularly busy when we visited but you get the sense that even with a full house, the staff would be attentive and kind. It’s the type of service that reassures me that even in the midst of Melbourne’s bustling brunch scene, I feel appreciated as a customer. Great food, health conscious, fantastic service and a chilled atmosphere, Mr Hubbard really is a café that ticks all the boxes. For more Melbourne brunch reviews and daily eats, follow Juliana on Instagram @juliimare.